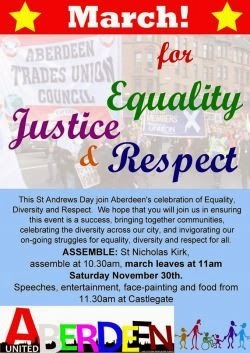 Please come along and join us at the St Andrew’s Day March and Rally, on Saturday 30th November in Aberdeen, to give a clear message that racism and fascism are not welcome here in Aberdeenshire. 10.30 am Assemble at St Nicholas Churchyard. Look out for the branch banner and join us to march behind it. There will be speakers from Trade Unions, Community Organisations and Political Parties at the rally. Kate Ramsden, Aberdeenshire UNISON Branch Chair will be chairing the Rally.